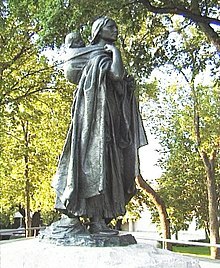 "Sacagawea" (1910), North Dakota State Capitol, Leonard Crunelle, sculptor. Sacagawea  (c. 1788 – probably December 20, 1812; was a Lemhi Shoshone woman, who went along with the Lewis and Clark Expedition as an interpreter and guide. Lewis and Clark explored the Western United States with her, travelling thousands of miles from North Dakota to the Pacific Ocean between 1804 and 1806. Sacagawea is well remembered today. When many people think about Lewis and Clark today, they also think about Sacagawea. In 2000, the United States Mint issued the Sacagawea dollar coin in her honor, showing Sacagawea and her son, Jean Baptiste Charbonneau. The face on the coin was made to look like a modern Shoshone-Bannock woman named Randy'L He-dow Teton. This was because nobody knows exactly what Sacagawea looked like. In 2001, she was given the title of Honorary Sergeant, Regular Army, by President Bill Clinton. Not much is known for sure about Sacagawea. At about thirteen years of age, Sacagawea was taken as a wife by Toussaint Charbonneau, a Quebecer trapper living in the village. He had also taken another young Shoshone named Otter Woman as a wife. Sacagawea was pregnant with her first child when the Corps of Discovery arrived near the Hidatsa villages to spend the winter of 1804–1805. Captains Meriwether Lewis and William Clark built Fort Mandan. They interviewed several trappers who might be able to interpret or guide the expedition up the Missouri River in the springtime. They agreed to hire Charbonneau as an interpreter when they discovered his wife spoke Shoshone, as they knew they would need the help of Shoshone tribes at the headwaters of the Missouri. 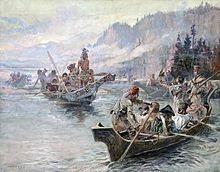 "a French man by Name Chabonah, who speaks the Big Belly language visit us, he wished to hire and informed us his 2 squars ("squaws") were Snake Indians, we engage him to go on with us and take one his wives to interpret the Snake language…"
Charbonneau and Sacagawea moved into the expedition's fort a week later. Clark nicknamed her Janey. Lewis wrote about the birth of Jean Baptiste Charbonneau on February 11, 1805. In April, the expedition left Fort Mandan and headed up the Missouri River in pirogues. They had to be poled against the current and sometimes pulled from the riverbanks. On May 14, 1805, Sacagawea rescued items that had fallen out of a capsized boat, including the journals and records of Lewis and Clark. The corps commanders, who praised her quick action, named the Sacagawea River in her honor on May 20. By August 1805, the corps had found a Shoshone tribe and was trying to trade for horses to cross the Rocky Mountains. They used Sacagawea to interpret and discovered that the tribe's chief was her brother Cameahwait. "Shortly after Capt. Clark arrived with the Interpreter Charbono, and the Indian woman, who proved to be a sister of the Chief Cameahwait. The meeting of those people was really affecting, particularly between Sah cah-gar-we-ah and an Indian woman, who had been taken prisoner at the same time with her, and who had afterwards escaped from the Minnetares and rejoined her nation." "The Interpreter & Square who were before me at Some distance danced for the joyful Sight, and She made signs to me that they were her nation." The Shoshone agreed to trade horses to the group, and to provide guides to lead them over the cold and barren Rocky Mountains. The trip was so hard that they were had to eat candles just to live. When they went down into the more temperate regions on the other side, Sacagawea helped to find and cook camas roots to help them get their strength back. As the expedition approached the mouth of the Columbia River on the Pacific Coast, Sacagawea gave up her beaded belt to let the captains trade for a fur robe they wanted to give to President Thomas Jefferson. On the trip back, they came near the Rocky Mountains in July 1806. On July 6, Clark wrote "The Indian woman informed me that she had been in this plain frequently and knew it well.... She said we would discover a gap in the mountains in our direction..." which is now Gibbons Pass. A week later, on July 13, Sacagawea told Clark to cross into the Yellowstone River basin at what is now known as Bozeman Pass. This was later chosen as the best route for the Northern Pacific Railway to cross the continental divide. While Sacagawea has been thought of as a guide for the expedition, she probably only gave directions a few times. Her work as an interpreter certainly helped the party to talk with the Shoshone. However, the most important thing she did for the group may have been being there during the hard journey, which showed they did not want to attack any Native Americans they came across. While traveling through what is now Franklin County, Washington, Clark noted, "The Indian woman confirmed those people of our friendly intentions, as no woman ever accompanies a war party of Indians in this quarter," and, "the wife of Shabono our interpreter we find reconsiles all the Indians, as to our friendly intentions a woman with a party of men is a token of peace." After the expedition, Charbonneau and Sacagawea spent three years among the Hidatsa before accepting William Clark's invitation to live in St. Louis, Missouri in 1809. "An 1811 journal entry made by Henry Brackenridge, a fur dealer at Fort Manuel Lisa Trading Post on the Missouri River, stated that both Sacagawea and Charbonneau were living at the fort. He recorded that Sacagawea "…had become sickly and longed to revisit her native country." The following year, John Luttig, a clerk at Fort Manuel Lisa recorded in his journal on December 20, 1812, that "…the wife of Charbonneau, a Snake Squaw [the common term used to denote Shoshone Indians], died of putrid fever." He went on to say that she was "aged about 25 years. She left a fine infant girl". Documents held by Clark show that her son Baptiste had already been entrusted by Charbonneau into Clark's care for a boarding school education, at Clark's insistence (Jackson, 1962)." As further proof that Sacagawea died in 1812, Butterfield writes: "An adoption document made in the Orphans Court Records in St. Louis, Missouri states, 'On August 11, 1813, William Clark became the guardian of 'Tousant Charbonneau, a boy about ten years, and Lizette Charbonneau, a girl about one year old.' For a Missouri State Court at the time, to designate a child as orphaned and to allow an adoption, both parents had to be confirmed dead in court papers." ↑ "Captain Clark created the nickname "Janey" for Sacagawea, which he transcribed twice, November 24, 1805, in his journal, and in a letter to Toussaint, August 20, 1806. It is thought that Clark's use of "Janey" derived from "jane," colloquial army slang for girl." Anderson, Irving W. "The Sacagawea Mystique"
↑ 5.0 5.1 "The Journals of the Lewis and Clark Expedition Online: August 17, 1805". ↑ "The Journals of the Lewis and Clark Expedition Online: October 13, 1805". ↑ Drumm, Stella M., ed. (1920). Journal of a Fur-trading Expedition on the Upper Missouri: John Luttig, 1812-1813, St. Louis: Missouri Historical Society. ↑ Butterfield, Bonnie "Spirit Wind-Walker". "Sacagawea: Captive, Indian Interpreter, Great American Legend: Her Life and Death". This page was last changed on 14 February 2019, at 13:19.